Join Capt. B.J. on one of our upcoming private deep sea fishing charters in the beautiful Gulf of Mexico, departing from Panama City Beach. You will have an exciting day on the water as he leads you straight to the best fishing grounds in the area. Get your cooler ready to bring home the ‘Catch of the Day’. You can have the whole boat to yourselves with a totally private fishing charter OR if you are on your own or just 2-3 people we can get you in with another small group to share the costs. Whatever way you choose you will be sure to have a great day on the boat. Our trolling trips can be either 4, 5, 6 or 8-hour trips. 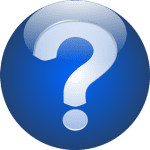 Troll fishing is when the boat stays moving forward at a slow speed while dragging baits at various distances behind the boat. Once the fish strikes the bait it is time for someone to grab the pole and reel in their catch. On these trips we normally fish 4 rods at a time using artificial, fresh and live bait depending on targeted species. We offer early morning mid-day or afternoon trips. Most people think that the morning fishing is always the best. This is not the case. Some of our best trips we have had have been midday or afternoon. So, if you not an early riser we can still have a very successful trip later in the day. Here at HUC, depending on time of year and seasons our troll fishing trips normally have a short 15 to 45-minute ride to get to the fishing grounds. On these trips we are normally in the 1 to 10-mile range from shore. 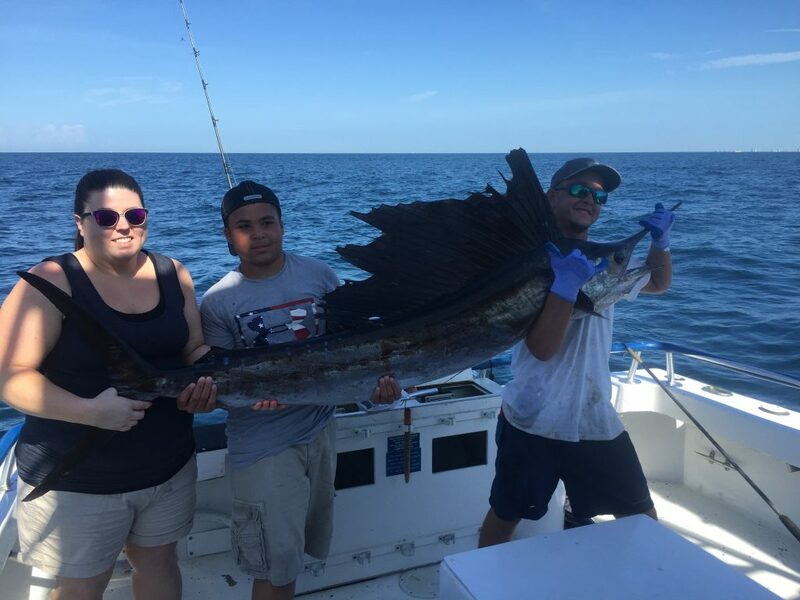 Early in the season, spring trolling is normally outstanding and we are mainly catching Spanish mackerel, blue fish, skip jack, blue runner, bonito and occasionally king mackerel… and if you get really lucky, cobia. Cobia migrate through the Panama City Beach area in April and is a favorite spring fish to target, although luck must be on your side because it is a fish you must first sight in order to target. 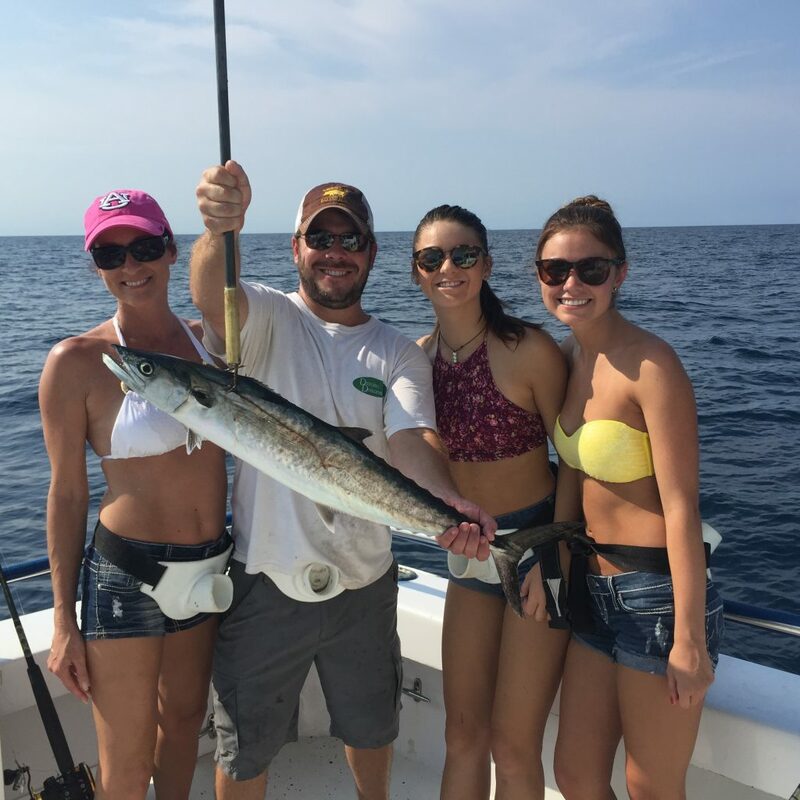 As the fishing season progresses the king mackerel and bonito get more and more plentiful, mahi mahi, and wahoo also start showing up. 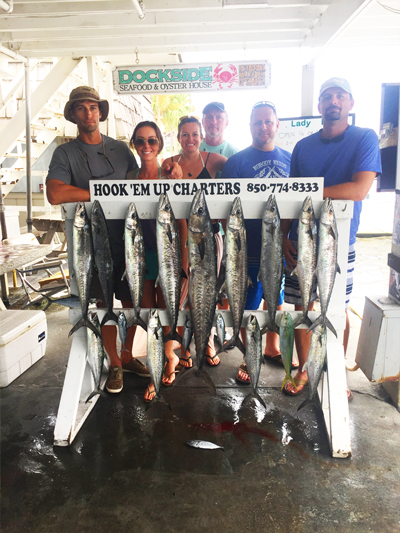 King mackerel are the most plentiful species we target on these trips during the summer and fall months. These fish normally range in the 8 to 20-pound range and can occasionally reach up to 50 pounds or more. HUC’s personal best is 55 pounds! These trips can be great for first-timers and kids, we are normally in sight of land on these trips and sometimes even in the bay area where the seas are always calm. All trips are for up to 18 passengers. Our bottom fishing trips range from 6-hour trips, all the way up to 2-day trips, normally going up in length in 2-hour increments 6, 8, 10, 12 hours etc.… Bottom fishing mainly takes place further offshore than our trolling trips. To bottom fish, we head out to the local shipwrecks, artificial, and natural structures in the Gulf of Mexico. Capt. BJ has over 11,000 reefs marked in the Gulf of Mexico, off the Panama City Beach and 30A areas. Some of these coordinates have been passed down to him from his grandfather and father that were found over 40 years ago and are still producing great fish to date. Once we get to bottom fishing hot spots the action begins! Depending on the length of the trip and where we have been having the best luck fishing, will dictate the ride time for these trips. Normally drive time ranges from 1 to 3 hours out. Most of our bottom fishing takes place in the 10 to 50 miles range from shore. We do our best to put you on the best amount of fish possible for the amount of time we have to work with. Depending on tides, conditions and species targeted, we can fish up to 12 anglers at a time in perfect conditions, we sometimes must reduce the number of anglers to stay productive and keep the tangles to a minimum. The more lines we can keep in the water the better the fish bite plain and simple! Bottom fishing is when you bait your line and lower it all the way to the gulf floor or suspend the bait just above the fishing structures we are fishing. 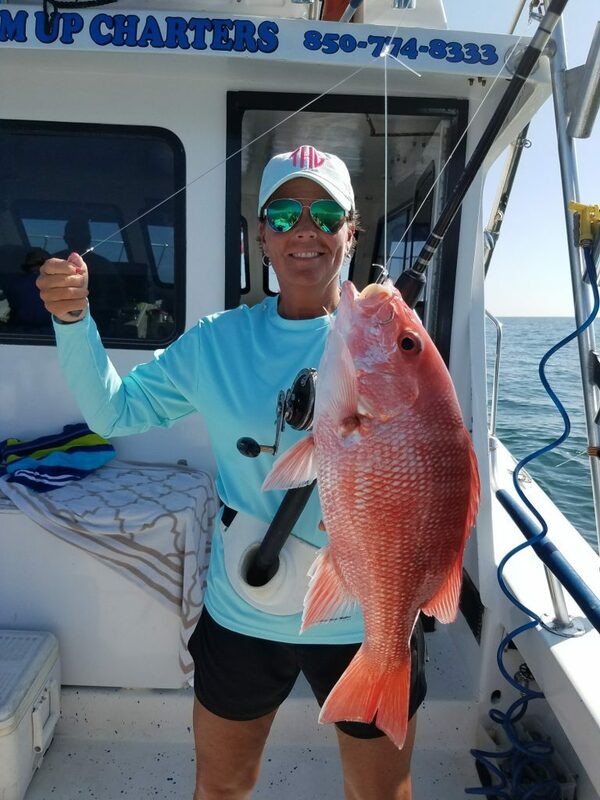 Some of the targeted species we fish for are red snapper, black snapper, vermilion snapper, white snapper, amberjack, triggerfish, gag and red grouper just to name a few. What we can bring home is dictated by what is in season for that particular time of year. We fish a variety of different baits depending on the fish we are targeting, for example, we use live herring, squid, cigar minnows, pinfish, Boston mackerel and many other baits. Bottom fishing is the most consistent type of fishing we offer and takes no skill set to be successful. Out experienced deckhand has the knowledge and skill set to teach every angler proper technique and to make every trip a success. The bottom fishing bite happens throughout the day so trips can either be in the morning or afternoon depending on your schedule and preference. Kids love these trips because the action is nonstop! We offer “meat trips” which is a type of bottom fishing trip where we target all the species, which are in season, that we can bring home to eat. We also offer catch and release bottom fishing trips which are normally for larger species of fish that are unfortunately out of season. We don’t get to bring the targeted species home due to regulations but you have a memorable trip with tons of pictures and get to experience a fight of a lifetime. Either way you decide in your trip decision, you have found the right boat to make your trip a success. Trips are for up to 18 people. 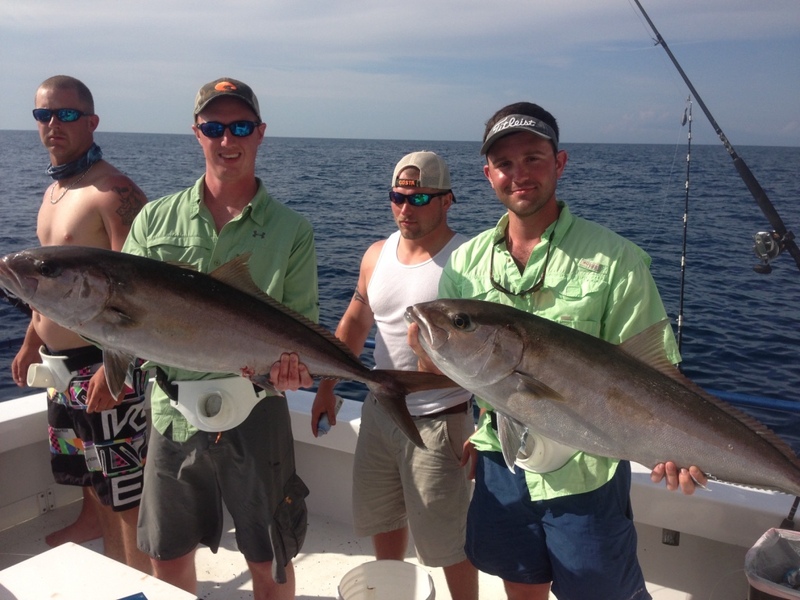 These blue water big game trolling charter trips are for the avid experienced anglers wanting the chance at big fish! These trips start at a minimum of 12 hours and can go for as long as 4 days. Any of these trips that are 24 hours or longer are for 6 people or less. On these trips, we are normally in the 50 to 200-mile range from shore, fishing weed lines, tide lines, underwater mountains and oil rigs. We fish 4 to 7 poles at a time depending on exact technique. These poles are tournament grade 2-speed, gold reels costing over $1200 each, the absolute best tackle available. You never know when you may hook that 1000-pound monster. We use artificial, fresh, and live bait. We can target yellowfin tuna, black fin tuna, wahoo, mahi mahi, blue marlin, white marlin, sailfish, and swordfish. Departure time depends on what species we are targeting. These trips can be a little hit or miss. If it’s a hit it will be a trip you will never forget. Shark fishing trips are normally either 4, 6, 8, 10, or 12-hour trips. The average sharks we catch are normally in the 6 to 10 ft. range. BIG!!! Hammerheads, tiger sharks and bull sharks are the most common in the Panama City Beach and 30A areas. One of the scariest things about shark fishing is that we are normally always in sight of land when we shark fish. We shark fish normally by anchoring the boat or drifting in an area that are known for sharks and setting out our baits. We normally set 2 or 3 baits depending on conditions. Once we get our baits in the water it is a waiting game. It’s a lot like catfishing but when you get that bite it gets very exciting, very quickly. 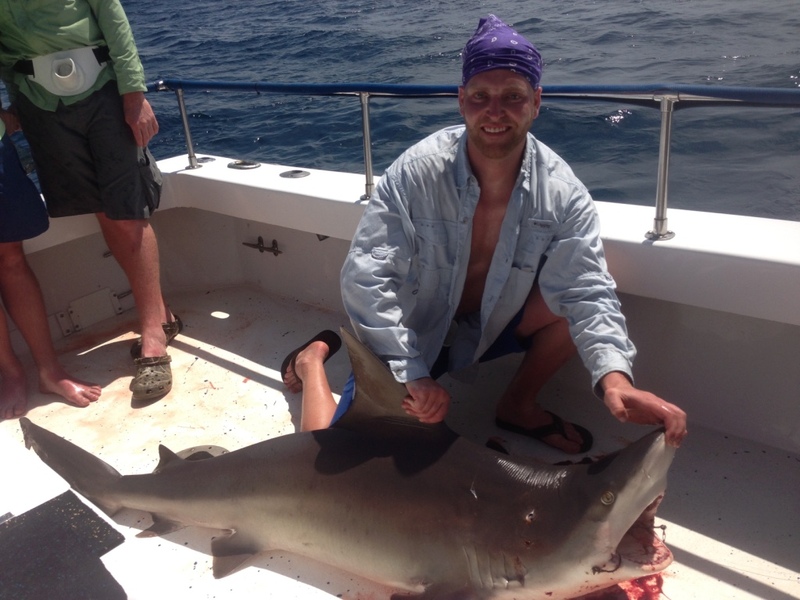 Once hooked, the battle is on, you fight the shark right up next to the boat for pictures. This takes time and patience because most sharks don’t give up easy. The battle can range anywhere from 10 minutes to 4 hours depending on size and species of shark. Most species we catch must be released due to regulation. If you do catch a legal species we give you the choice to harvest that fish. Some anglers love to keep the jaws as a keepsake and eat shark meat throughout the winter. If this is you, we have the experience to bring the shark on board carefully and safely and get him the ice chest for the ride home. Our largest shark to date is a 14 ft. hammerhead that took us 4 hours to land and was estimated at 800 pounds. Sharks trips are for groups of up to 18 people. These fishing trips are our specialty! Depending on the length of your trip. There is a 6 hour minimum on the combination trips; combo trips allow you to experience 2 or 3 different types of fishing on one trip. Whether you want to troll and shark fish, bottom fish and troll, shark fish and bottom fish or try all 3 types we can make your day a success. If you decide you want fish for your freezer but are worried about eating it all, we do combo bottom fishing “meat trips” and catch and release trips. Split charters are private charter trips we offer to smaller groups of normally 4 people or less. On these trips, we join you in with other small groups of people that are looking to do the same type of fishing as you, to make the trip more affordable for each group. Give us a call for details on what we have available! Cruise the calm waters of the Panama City Beach and 30A area and see the sights. We encounter dolphins, sea turtles and pelicans along with lots of other sea life. 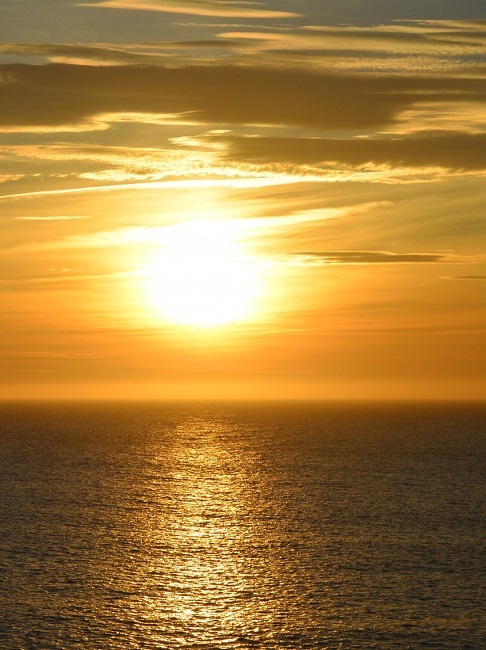 Watching the beautiful sunset on the Gulf of Mexico is a sight hard to beat. Whether it’s a family outing or a private trip for a couple, it’s a trip you will not want to miss. Our Alligator hunts take place in local rivers and lakes in the Panama City Beach FL area. These hunts must be booked years in advance due to the limited time allowed for hunting and amount of tags available. Due to the hunts we already have booked, our first available hunt is in 2022. We target and harvest alligators from 6 to 12-feet in length and weighing up to 800 pounds. 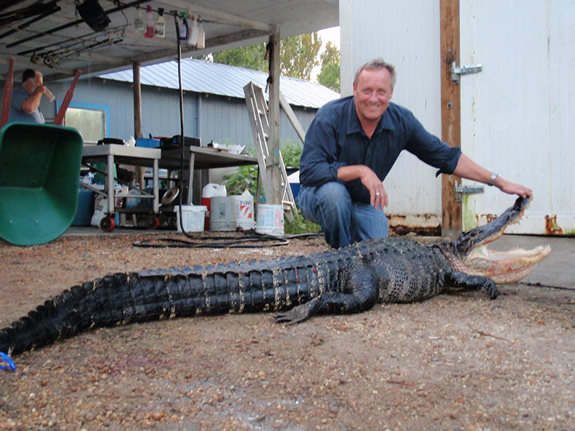 Our largest harvested was a 12 ft. 11-inch alligator weighing 817 pounds. Please call us if you would like more details on what we can offer. We are one of the best in the business for producing large catches but our fishing trips are about more than just catching fish, they are trips of a lifetime, that families and their children will never forget. It is our job to make sure you have the fishing experience you have been looking forward to all year. We want to make your trip an unforgettable and enjoyable experience for the whole family. We cater to each charter individually whether it’s a group of guys, a bachelor/bachelorette party, company outing or just a group of friends ready to fill the cooler.